Admittedly this isn’t usually the time of year we think about swifts. Right now they’ll be thousands of miles away, south of the Sahara, zipping through the African skies. But right now, they also need our help. Did you know that numbers of these aerial athletes had crashed by half in just twenty years? We don’t know for sure the reasons behind this shocking statistic, but it’s clear that one of the biggest problems facing swifts in the UK is a severe lack of nesting sites. Historically, swifts would have nested in caves, or in holes on cliffs and ancient trees. But as our towns and cities grew and spread they adapted to live alongside us, squeezing into gaps under the eaves of buildings. Modern construction and renovation methods have meant that today's buildings just don’t have entrances for swifts, and holes previously used by the birds are being blocked up. This presents site-faithful swifts with a huge challenge: after an epic journey over desert, jungle and ocean they can arrive and find their nest is no longer accessible. You will find the best advice through Action for swifts and Swift Conservation first and foremost. You can also join a local swift group: a map of the groups you can join is available here. 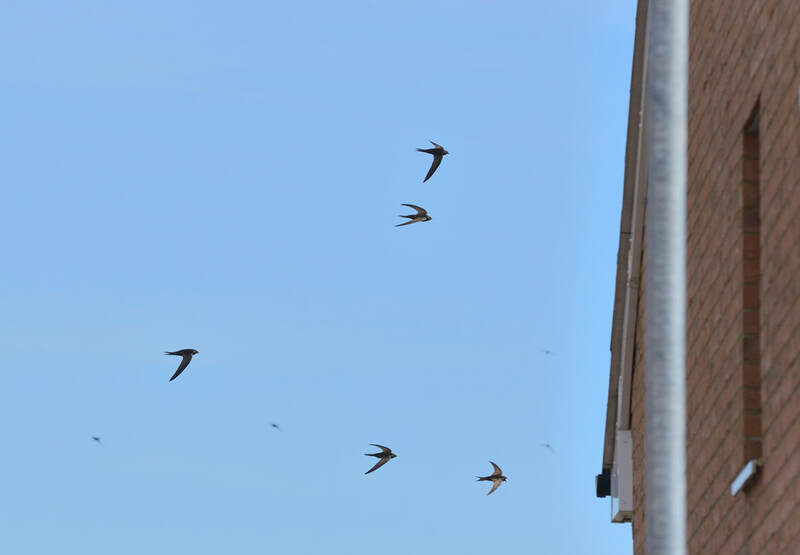 Swifts make great neighbours – there’s no mess (adults eat most of the chicks’ droppings), they’re only here for 12 weeks a year and they’re great to watch! If your home, school, college or workplace has a suitable area for swift homes then you have a few options if you wish to buy or make a suitable 'swift home'. 1) The swift box. The RSPB’s new box was designed by experts to give swift chicks the best possible start in life. There’s a sloping roof to keep the rain out, and even a shallow nest cup inside to hold the eggs in place. 2) The swift brick. Manthorpe building products, working with swift experts, have come up with this nifty little box that fits neatly within the cavity of a wall. So if you’re having a building constructed or renovated, this is the one for you! 3) DIY. You can even make your own swift box: detailed instructions and a ‘how to’ video are on the Action for swifts website. Lastly, when the swifts arrive in late April/early May, the RSPB would like your reported sightings through the RSPB Swift Survey. Data from the survey can help local planners and ecologists ensure there will always be homes for urban swifts going forward.